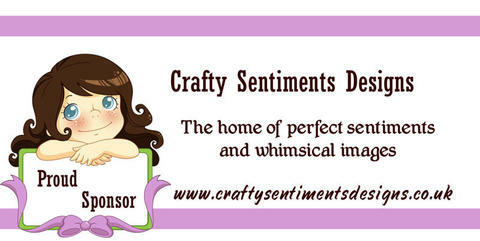 It's Wednesday and time for a new challenge at The Perfect Sentiment. This week we are challenging you to create a card for the occasion or holiday of your choice and include a creature or critter on it somewhere. Our Sponsor is Crafty Sentiments Designs. They will award one lucky random winner with 3 Free Digis of their choice. My card today is created with digital images provided to me by Daydream Designs. Thanks Diane! Diane invited me to be on her Dream Team and as you may all recall, I accepted that invitation and was pretty excited about it. Well, as it turned out, I wasn't so great at working with digital images so, I had to step down. Diane was very gracious and supportive to me and has left the door open for me to come back when I feel like I'm ready and am more comfortable working with the images. So, today's project is a little practice work. The images I have used today are pre-colored digis. 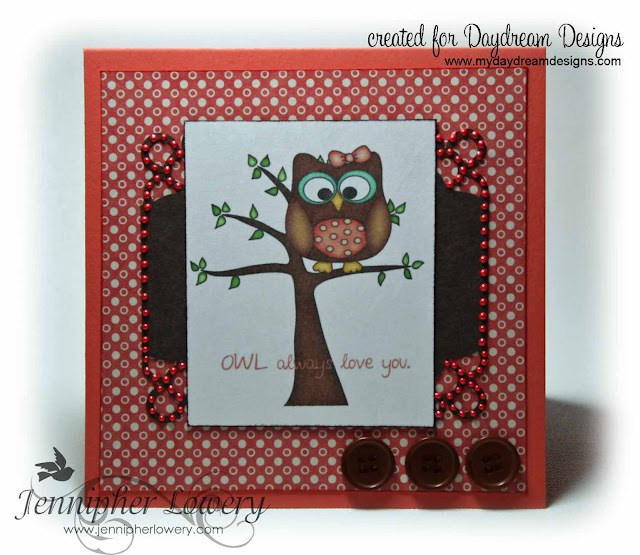 The tree and the owl are two separate images that I layered in Photoshop Elements to create the scene that you see on my card. The polka dot patterned paper is also digital and it just happens to match perfectly with Stampin' Up! Calypso Coral. Supplies: Calypso Coral CS-SU; Early Espresso CS-SU; corner punch-Martha Stewart Crafts; Ruby Red Liquid Pearls; Owl Sentiments, Owl Always Love You Colored Digi Set, Owl Always Love You Digi Paper Pack, all from Daydream Designs; brown buttons from my stash. Thanks for stopping by my blog today! God Bless You. This is so cute, Jennipher!! I'm glad you are getting the hang of using digis!! This looks great! 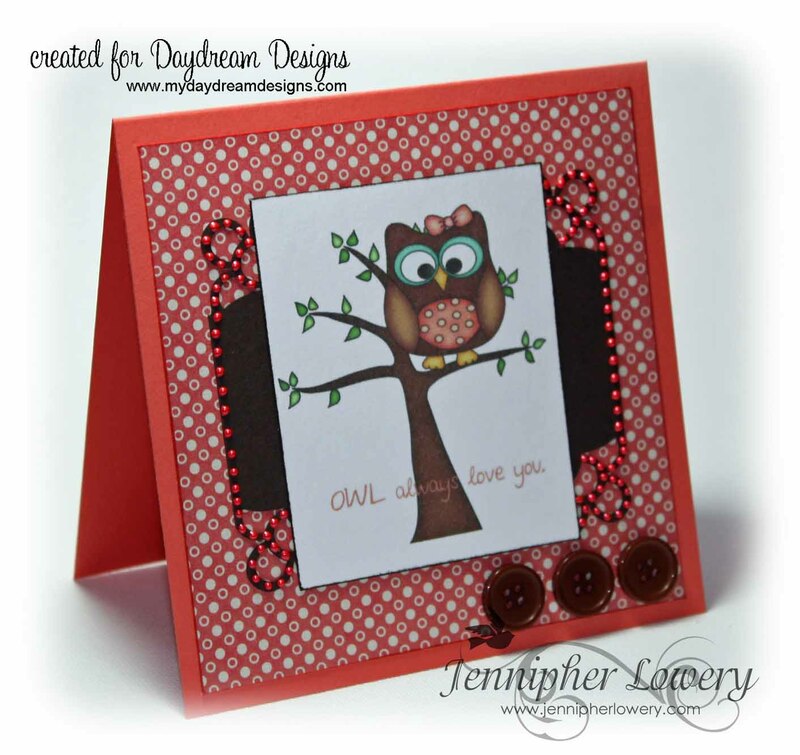 Hi Jennipher this is just fantastic what a super card and fabulous design Great work . Beautiful Jennipher! I love the way you have placed the pearls. Oh I love your card! great design and colouring, and the sentiment is superb! Like the Owl. Especially like the red liquid pearls. My daughter likes Owls so I may have to CASE your card. Jennifer I think you did a great job with your digital images. Just trying to master Photoshop is difficult to me but stick with it. I love the digi paper too !! Cute images and great buttons and pearls! Reading you post, I realize there's a lot more involved than I thought - just that you had to put the tree and owl together! I think this is great! i love the cute owl so much! the image is so lovely and cute! What a great card! Excellent job. You are definitely getting to be a pro. Love how this turned out. It's so adorable! Fantastic and adorable. Thanks for your lovely visit and sweet luv. Hugs. Oh my word how I love all those liquid pearl dots....AWESOME! That owl is so adorable! Very clean card. Love it. wow! You did a fabulous job! See! You can work with digis! I love it! Great job with the owl and tree! Look at all those cute little liquid pearls. Fantastic! This stamp is just adorable!! You did such a wonderful job coloring the image! Jenn, sorry for posting a personal message here, but my internet is down until Wednesday, so I can't email you. Phone is not synching to emails so I'm out of pocket until Wednesday. Just FYI! You did a fabulous job merging the two images together on this adorable card! Love all the pearls on the frame!! Fantastic job on this one - love the image and overall design! Your card is so adorable. Love the image the you used and your cute layout. The pearls really add to it. WHOO loves this card? I do! Very cute! How cute is this!! Love that owl and the three buttons at the botton! Thanks for playing along this week at Twisted Tuesday Challenges!